In 1962 Steve Ricketts was born into London’s derelict and disused docklands, a fantastic and dangerous playground to explore as a youngster but not the best place in the world to start a fishing career. He was educated at John Evelyn school in Deptford and Scott Lidgett in Bermondsey . . . but the least said about education the better. On leaving school he became a bricklayer, later a stained glass window restorer and now works as an ultrasound engineer on the railway. The fishing career with eels started mainly because he could take the fish home and feel pretty chuffed with all the 'well done lad' comments and the hair ruffling. He’s moved on a lot since then and is now more interested in conservation and bankside comfort; brollys with a tarp have been replaced by proper comfy bivvies and, of course, soft toilet paper. If only the Angling Times knew of its alternative uses they may have never have printed any of his photos. But his knowledge of all aspects of the eel soon exceeded what was needed to just go and catch them, so he penned his Eels book on the banks while awaiting darkness to fall and the eels to turn on. And as for career highlights? Probably appearing in the television series The Compleat Angler and having his pictures displayed in the Angler's Mail or Angling Times - particularly when you consider what a low profile eel fishing has. 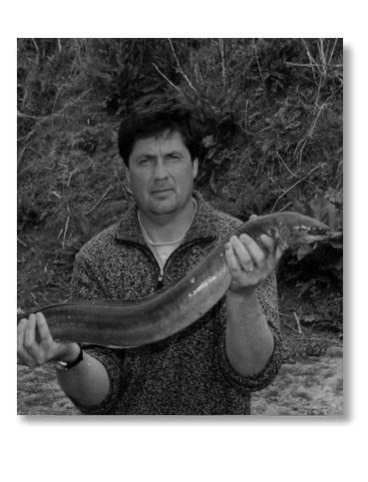 Eels - The Final Frontier was his first book and he hopes his enthusiasm for this underrated and misunderstood species will encourage a few more anglers to have a go . . .
Steve is a member of the National Anguilla Club.